The Certified Aging-in-Place (CAPS) designation program, developed by the National Association of Home builders (NAHB), teaches the technical, business management and customer service skills essential to competing in the fastest growing segment of the remodeling industry-home modifications for aging in place. 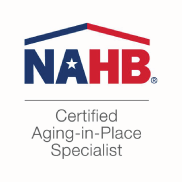 NAHB Remodelers, in collaboration with the AARP, developed this program to provide comprehensive, practical, market specific information about working with older and maturing adults to remodel their homes for aging in place. Aging in place means remaining in one’s home safely, independently, and comfortably, regardless of age, income or ability level. It means the pleasure of living in a familiar environment throughout one’s maturing years and the ability to enjoy the familiar daily rituals and the special events that enrich all our lives. It means the reassurance of being able to call a house a “home” for a lifetime. To age in place you may need to modify your house to be more comfortable. It could mean some simple solutions for us baby boomers like changing hard to operate door and cabinet hardware, to better lighting, to installing grab bars in tub/showers. For some, it means widening doors for wheelchair access, lowering light switches, curb less shower remodels, and so many options for the disabled or elderly. I am a CAPS professional. Call me for a consultation. We want you to age in place gracefully. For information go to www.NAHB.org. The Environmental Protection Agency’s “Renovation, Repair and Painting (RRP) Rule 40 CFR part 745”, passed into law April 2010, requires that those engaged in RRP activities in homes or child occupied facilities built prior to 1978 be trained and certified in lead safe work practices, and use these work practices to guard against lead contamination. It also requires that contractors provide information on lead safety prior to beginning work. Infants and young children are especially vulnerable to lead exposure, which can cause developmental impairment, reading and learning disabilities, impaired hearing, reduced attention span, hyperactivity and behavioral problems. Adults with high lead levels can suffer difficulties during pregnancy, high blood pressure, nerve disorders, memory problems and muscle and joint pain. 4 Rivers Contractors, Inc. is an EPA certified firm with a certified renovator on staff. If you hire a contractor to remodel your home, ask to see proof of EPA certification. For more information go to www.epa.gov/lead/rrp/index.html.